The twinkling street lights, harried shoppers and incessant parties can only mean one thing - the festive season is well and truly upon us! As the old song goes, it really is the most wonderful time of the year, a chance to spend quality time with your nearest and dearest. To celebrate the beginning of the season, holiday cottage company Stay In Cornwall has come up with a special Christmas brain teaser that is leaving the average person very baffled. An illustrated scene depicts a family in the midst of a Christmas Eve party. All is going swimmingly until the father realises that not one, but five turkeys have made a bid for freedom and have gone missing from the kitchen! Where could they have gone? 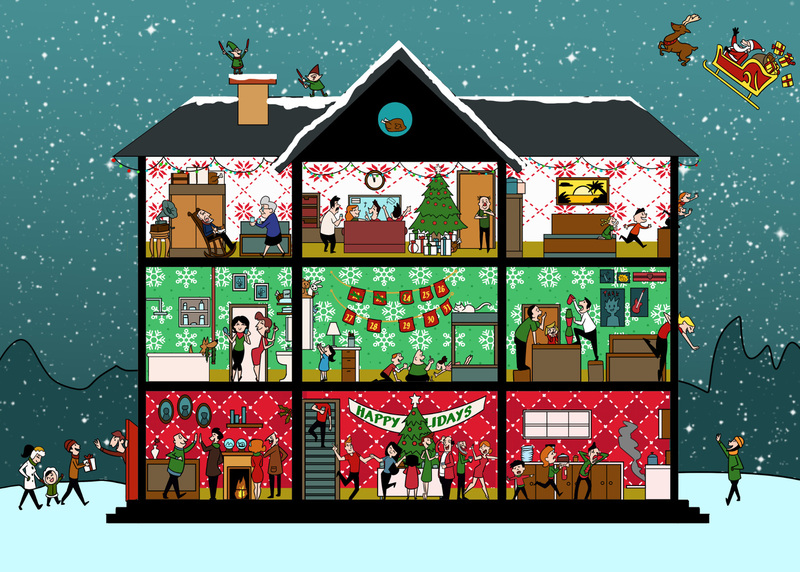 The busy scene gives a snapshot into the nine rooms of the house, with turkeys hiding amongst napping grandparents, playing kids and people having a Christmas boogie. Even Santa and his elves are getting in on the action! There’s so much happening in this cottage, you won’t know where to begin! On average, it’s taking people around three minutes to locate all five of the turkeys. James Starkey, marketing director of Stay in Cornwall says, “this brain teaser has had all of us scratching our heads right from the start, mainly because it’s deceptively tricky”. As for the theme and purpose of the Christmas puzzle, “we wanted to create something fun and seasonal for our audience, and we definitely managed to incorporate the festive feeling of being with the family on Christmas Eve”. Stay In Cornwall specialises in holiday cottages and accommodation in Cornwall. Its experts are passionate and knowledgeable about the county, and pride themselves in providing holidays with a personal touch. The selection of properties available range from coastal apartments with sea views to converted barns surrounded by rolling countryside. Our media pack contains the illustration, quotes and more. This press release was distributed by ResponseSource Press Release Wire on behalf of Re:Signal in the following categories: Leisure & Hobbies, Home & Garden, Women's Interest & Beauty, for more information visit https://pressreleasewire.responsesource.com/about.